ADAMED SmartUP and the Golden Clip! The social activity of the Adamed Group was once again appreciated in this prestigious contest. 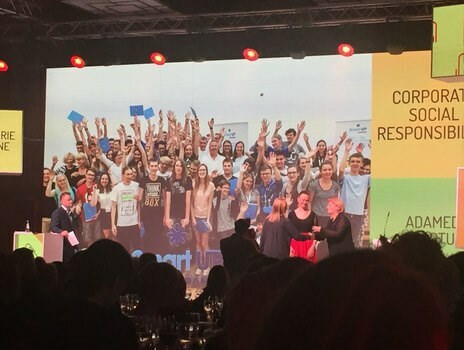 The ADAMED SmartUP Programme, together with the Walk agency, won the 14th edition of the Golden Clip (Złoty Spinacz), as announced during the gala. ADAMED SmartUP, in the prestigious Golden Clip PR contest, Golden Clip, was nominated in two categories: Creativity and Corporate Social Responsibility (CSR). The jury appreciated the PR activity and its effectiveness, as well as noted the social and educational character of the initiative. The Golden Clip in the CSR category was received by Anna Kosińska, CRS Project Manager in the Adamed Group. Golden Clips is a contest organised since 2003. It was initiated by the Polish Public Relations Consultancies Association, whose aim is, above all, to promote the PR environment through honouring the most creative projects realised in Poland in their field. This year’s is the 14th edition. The list of nominees in 27 categories was presented on 3rd October and the awarding gala took place on 2nd December in the Westin hotel in Warsaw. This year’s trophies were for the first time awarded in three colours: golden, silver and bronze. And this is not the only prize ADAMED SmartUP won in recent months. The programme also won the title of “The Science Populariser” 2015 and Biały Listek CSR (CSR White Leaf), awarded by the ‘Polityka’ weekly. It was also mentioned in the 14th edition of the report entitled Responsible Business in Poland. Good Practices’, published by the Responsible Business Forum (Forum Odpowiedzialnego Biznesu, FOB). The project was also nominated in the “Educational Business Activities. The List of the Most Significant Initiatives” plebiscite by FOB and in the contest “Social Campaign of the Year 2015”.